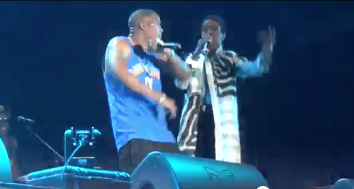 Nas & Lauryn Hill PERFORM "If I Ruled The World" In Switzerland + Kelis OWES Even More To The IRS! Yesterday, Nas performed at the Openair Frauenfeld festival in Switzerland where he brought out Lauryn Hill. Rocking one of his “Life Is Good” tank tops, he and Lauryn rocked out with “If I Ruled the World (Imagine That).” Sadly, life isn't so good for Lauryn who's facing serious jail time for tax evasion. We told you about Kelis' tax woes, and now it's being reported that she owes more than previously reported. Nas' ex-wife apparently has to pay up back taxes to the State of California AND even more the federal government. According to TMZ, she owes $61,737.29 in taxes in Cali for the years 2009 and 2010 and $213,932.02 to the IRS for the same years. So in total, she owes $606,096.12 in unpaid taxes to NY, Cali and the IRS. Clearly for Nas it wasn't cheaper to keep her. PREVIOUS: Juwan And Jenine Howard RENEW Their Wedding Vows As Dwyane & Gabby And Chris & Adrienne CHEER Them On! NEXT: TROPHY GIRLS: Serena & Venus Williams Pose With Their WIMBLEDON MEDALS! Lauryn Hills look strong, as far as the tax situation...and this too shall pass! i love this song...and love seeing them perform it, it makes me feel some kind of way... YBF, must you bring Kelis tax problems or Ms.Hill's into this post.... i mean really???? ?